The Super Bowl is the annual championship game of the National Football League, pitting the champion of the National Football Conference and the American Football Conference against one another. It is one of the biggest single day sports events in the world drawing high television ratings each year. The 2015 Super Bowl had a record-breaking average TV-audience of 114.4 million viewers. The huge exposure of the Super Bowl generates millions of dollars in advertising revenue for the NFL. The advertising revenue from the 2018 Super Bowl for example stood at around 408 million U.S. dollars. An average 30-second ad-spot during the Super Bowl broadcast cost an estimated 5.25 million U.S. dollars in 2019. The majority of consumers regard Super Bowl commercials as entertainment and about a quarter of respondents also said that these commercials make them aware of the advertisers' brands according to a 2017 Statista survey. It is estimated that Super Bowl-related consumer spending in the U.S. will stand at about 14.8 billion U.S. dollars in 2019. The average American consumer plans to spend around 81 U.S. dollars on Super Bowl Sunday. This expenditure includes, among other things, food & beverages, televisions, furniture, team apparel & accessories and decorations. Also part of these expenditures is the money used to place bets on the game. In 2018, bets to the value of around 158.59 million U.S. were placed at casinos in the state of Nevada. The host city of the Super Bowl is usually chosen by the NFL several years before the game. New Orleans (including Super Bowl XLVII) and Miami have hosted the game the most with ten games apiece. The Pittsburgh Steelers and the New England Patriots are the most successful team in terms of Super Bowl wins, having each won the Super Bowl an NFL-best six times. In 2019, players on the winning team made 124 thousand U.S. dollars for playing in the game, players on the losing team received 62 thousand U.S. dollars. 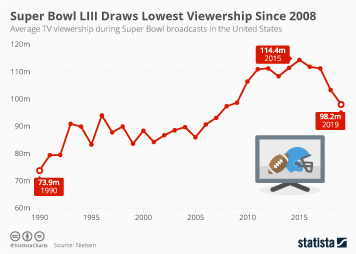 TV viewership of the Super Bowl in the U.S.